Need a quick and easy lunch or dinner? 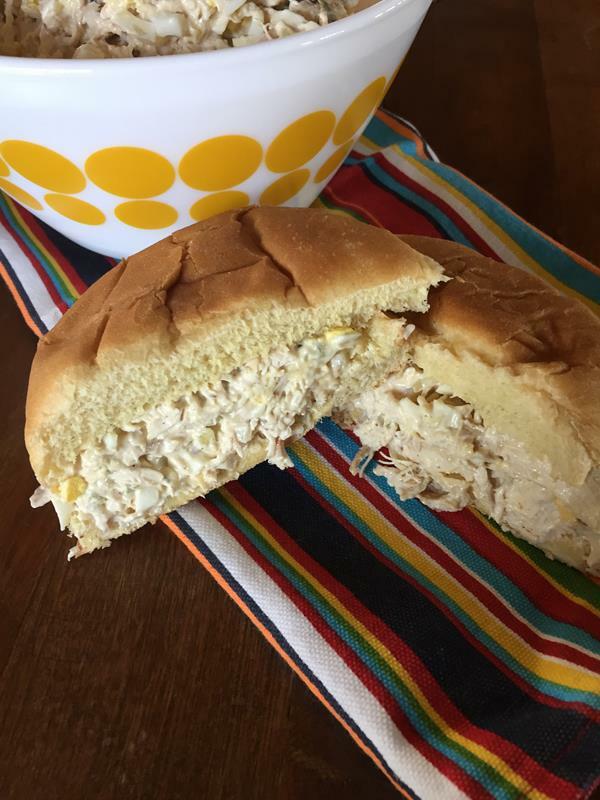 This classic chicken salad sandwich is perfect for a quick and easy meal. I grew up in Oregon, but have lived in Oklahoma for over twenty years. One of the things I have learned after living in two totally different parts of the county is how regional food can be. I grew up eating shrimp on pizza. Most people in Oklahoma think I am crazy when I talk about how good shrimp is on pizza. On the other hand BBQ Bologna is huge in Oklahoma. It in on the menu at almost every BBQ restaurant. When I mention BBQ Bologna to people in Oregon they can’t believe it is popular in Oklahoma. Chicken salad is another example of regional food. I ate chicken salad some growing up, but it certainly wasn’t a staple in my family. When I moved to Oklahoma I quickly realized that people in Oklahoma and people in the south, take chicken salad very seriously. And what you put in your chicken salad varies by region and family. I never knew that people could be so opinionated about chicken salad. Everyone has a best way of making it. I am not sure if it is my Oregon roots or just that I often like to keep things simple, but when it comes to my chicken salad most of the time I like to keep it simple and pretty classic. I don’t usually put anything odd in my chicken salad. No fruits. No nuts. No celery. I also like my chicken salad pretty shredded. As in I don’t like huge chunks of chicken. I want small pieces of chicken with the dressing completely mixed in. I use a food processor to get the best texture, but if you like chunkier chicken just cut it up or shred the chicken by hand. One of the things I love about chicken salad is that it makes a great summer lunch or dinner. As I am typing this up it is over 100 degrees here in Oklahoma. Turning on the oven is the last thing I want to do this time of year. But chicken salad doesn’t require the oven. I also love that I can make this ahead and serve it several different ways. I can serve it as sandwiches. My son loves to eat his on a hamburger bun with a slice of cheese. My girls enjoy it on gluten free bread. I prefer mine on a tortilla or on a piece of lettuce for a lettuce wrap. This is one of those recipes that is easy for everyone just to eat how they like it. To add some flavor to my chicken salad I like to use grilled or rotisserie chicken, but any cooked chicken will work. I would love to hear how you enjoy your chicken salad. Do you keep it simple or do you like to add things into your chicken salad? A basic chicken salad sandwich makes a simple and delicious lunch or dinner. Place cooked chicken in a food processor. Pulse a few times to chop up chicken. Add remaining ingredients and pulse a few more times or until desired consistency. Be careful not to over process. Serve on bread, tortillas, or lettuce. Refrigerate any leftovers. This will last for several days in the refrigerator so make extra for easy lunches. I sometimes add mustard too because my husband loves it. Growing up we ate a ton of tuna, but we always called them tuna sandwiches. 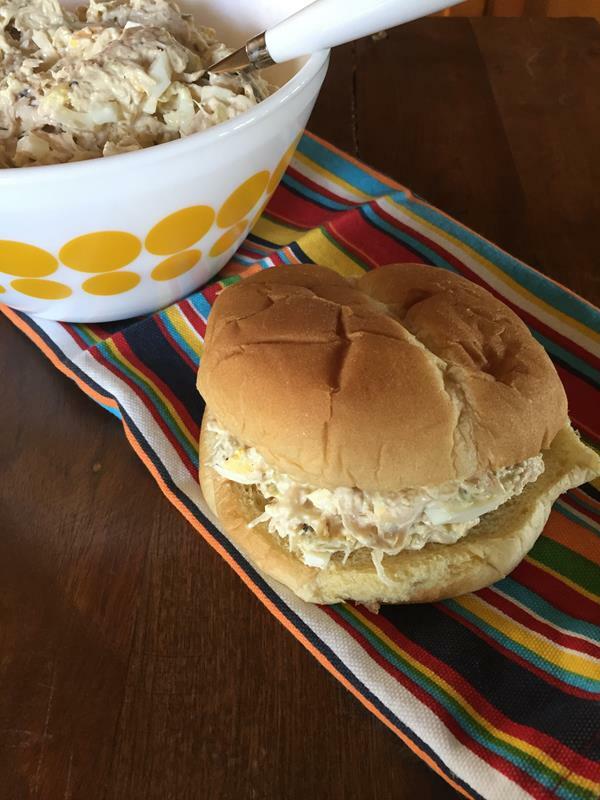 When I moved to OK people kept calling them tuna salad sandwiches and I realized it was because most people here put eggs in their tuna sandwiches just like you would for chicken salad sandwiches. I don’t think I have ever had a potted meat sandwich and I am pretty sure I will be fine skipping that one. 🙂 Food is so regional which is part of what makes it so fun. Chicken salad is very different here in Southwestern, PA. I have never heard of putting eggs in chicken salad before, ever! 😀 We make egg salad here but we don’t add eggs to chicken or tuna salad. Egg salad consists of hard boiled eggs chopped fine, Miracle Whip, salt and pepper. Basic chicken salad is chopped, cooked chicken, finely chopped celery, finely chopped onion, a little salt and pepper, Miracle Whip. From the comment above: what is potted meat? I haven’t heard that term before! I thoroughly enjoyed reading this post. It was very enlightening! Thank you! Growing up we had egg salad all the time and it was just as you described. Eggs, mayo, salt and pepper. Tuna was basically the same. It was tuna and mayo or miracle whip. I think eggs in tuna and chicken salad is definitely more of a southern thing. I had never heard of it until I moved to Oklahoma. And I agree with you, I love posts like this where everyone shares the different ways they make something like this. It makes food interesting and fun and I always learn new things from my readers!